T-Rex Center Door T Funny Altered by Aardvark Models. 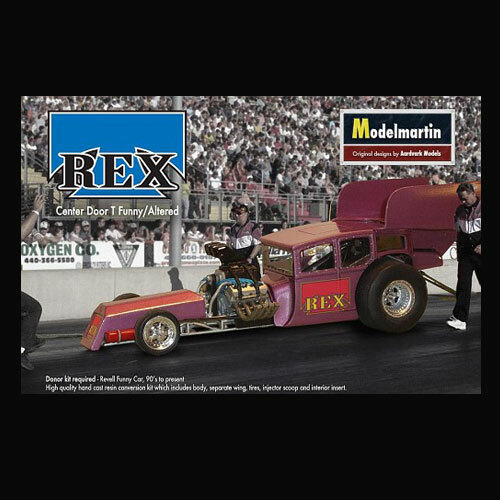 The T-Rex Conversion Kit is a complete kit to transform your yet another average funny car into a radical blast from the past. The kit includes a thin and cleanly cast bodyshell, separate hood, optional wing, fuel cell, interior tin insert, new style raised injector scoop, low-profile front tires and larger slicks, and decals. Everything fits on any of the modern era Revell funny car kits with minor modifications and scratch building.